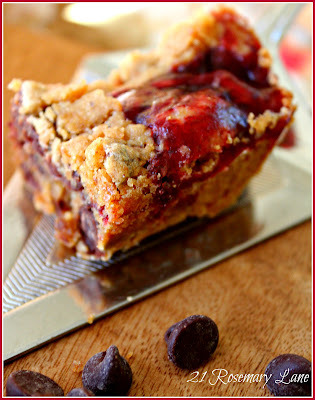 21 Rosemary Lane: The Easiest Cookie Bar Recipe Ever!! This recipe is so simple that it only takes 2 ingredients to make! All you need is an 18 oz. package of pre-made refrigerated chocolate chip cookie dough like Toll House brand, and some seedless raspberry preserves. Reserving 1/2 cup of the cookie dough, spread the remainder of it on the bottom of a 9 X 9 inch baking dish. Spread 1/2 a cup of the preserves over the top and then drop the remaining cooking dough in clumps across the top. Pop the dish into an oven pre-heated to 350 degrees and bake for 25 minutes. Let cool and then cut into 16 square bars. This recipe was so easy that these cookies were actually made by my 10 year old daughter Gracie! You can also use either blackberry or strawberry preserves for a yummy variation. Thank you so much for stopping by and have a super day!!! by clicking on the picjet fence below. 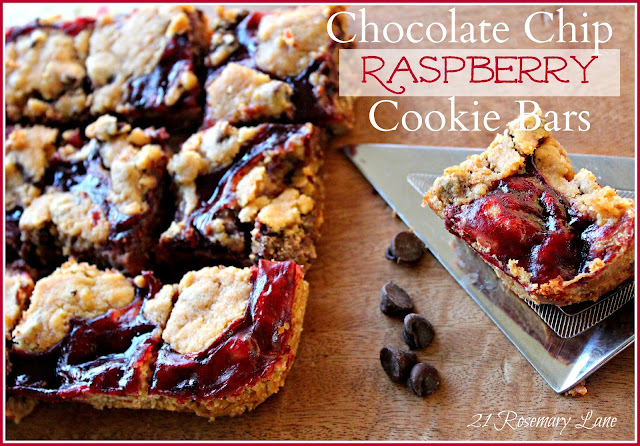 Looks so good, I love Raspberry, and the chocolate and raspberry combo sounds so good. Easy desserts are right what I need right now! yum! This looks amazing and delicious! Thanks for sharing. oh my! those look good! I will make these tomorrow! Thank you for sharing! Mmmm these bars look soooo good! What a great recipe, I love raspberry chocolate, so this sounds like something I would LOVE! MMMM I have a thing for bars like this! Love the sweet/tart combo. Thanks for sharing! !